Now that all the predictable grandstanding for the benefit of the world’s and Syria’s own internal state-controlled media is over, and now that we have been subjected to the larger than life Syrian Foreign Minister Walid Al-Muallem’s rants about the future fate of the presidency and the current ruling regime being ‘red-lines’, the tone of the Syrian regime’s ‘delegation-speak’ is shifting gradually. Yesterday Syria’s UN ambassador Bashar Al-Ja’afari said, when pressed in Geneva to talk about these matters by the BBC’s Lina Sinjab (their former Damascus correspondent), that it was ‘too early’ to talk about such things. If it is too early now, then the clear implication is that ‘such things’ may come onto the agenda later. For the time being the talks are beginning slowly, with hiccups, dealing with subjects that both sides may be able to agree on, namely, localised ceasefires, humanitarian corridors and prisoner exchanges. Also this morning, British Foreign Secretary William Hague speaking in London on the BBC’s Andrew Marr Show, was extremely bold and even outspoken, in the way he referred to the Syrian regime and to President Bashar Al-Assad. Hague always chooses every word with great care, so he made the British government’s position very clear when he declared it ‘inconceivable’ that a future Syrian transitional government could be led by the same person who had been responsible for blockading aid and thereby starving his own people. Yet, for all Bashar Al-Assad’s stupid mistakes in the early mishandling of peaceful demonstrations in Dera’a and elsewhere, he has been nothing if not clever in how he has handled matters more recently. From the start he announced to the world he was fighting ‘terrorist gangs’ and ‘sectarianism’. Under the guise of an amnesty he then slyly released around 1,000 jihadi and Al-Qa’ida fighters from his own jails, a fact which has now been corroborated by many sources including defectors. Bashar knew exactly what he was doing, that these fighters would go on to spearhead and swell Islamist groups. In other words he set out to make his own prediction come true. As a result the regime can present itself at Geneva II as a government that is fighting foreign terrorism, a fact reflected in the composition of its delegation – all foreign affairs people. It is worth noting an irony here, incidentally, that many of the released jihadis had been languishing in regime jails since they were arrested to please America, but before that the regime had itself sponsored them to cross over into Iraq to fight the Americans following the 2003 US invasion of Iraq. 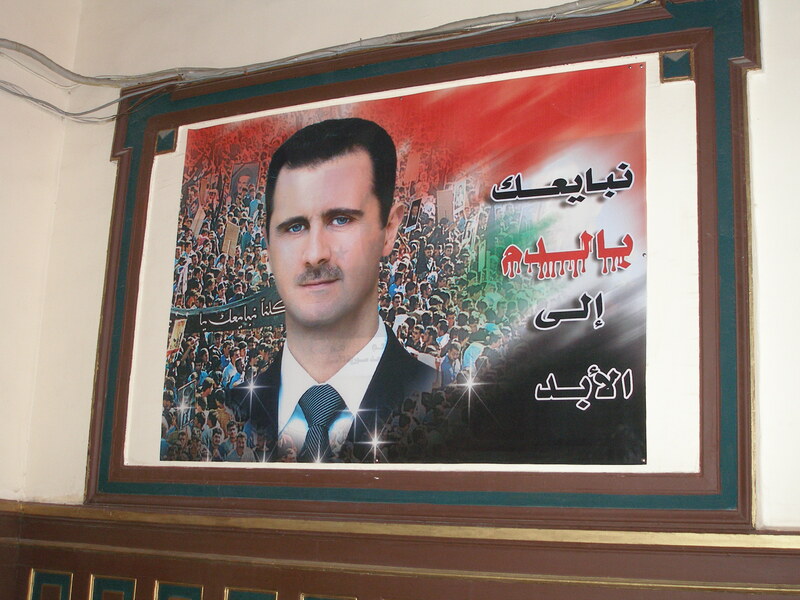 It is a move that would have made Bashar’s wily father Hafez proud. Last September’s Chemical Weapons deal has also worked in the regime’s favour, enabling it to present itself as a responsible partner, cooperating with the UN and the West, struggling valiantly to get the CW out of the country through rebel-held territory. Everyone forgot that just months earlier the regime was denying it even possessed CW. No matter, it is the image of cooperation that has stuck with the world’s media. Now with the humanitarian agreements on Homs, and maybe elsewhere in coming days, the regime will once again be able to portray itself as ‘the responsible partner of the West’. UN aid agencies and Red Cross workers are only permitted under international law to work with the ‘recognised government’ of a country, so the Syrian regime will relish the attention and take all the credit, playing it for all it is worth. With the massive sum, rumoured to be over $50 million, that they have allocated for media ‘coverage’ of Geneva II, the world needs to have its eyes wide open and not allow Assad to hijack public opinion. If anyone is in danger of believing the regime’s self-publicist and conciliatory rhetoric, they should remember the report released just ahead of Geneva II by three highly respected war crimes prosecutors, detailing the systematic ‘industrial-scale killing’ of 11,000 detainees in his prisons – the ones whom it served no purpose to release.